Look like a really good planewalker for blue mirror matchup. OK. I think now there's possibly a viable Superfriends Prison list out there. Let's call it "Hatewalkers". There is overlap in some of these walkers to the point where the first of walker B is likely better than the second copy of walker A, so I suspect you may see more cards with fewer copies in vintage. I would much rather be in a situation where I have some combination of Ashiok, Teferi, Dovin, Narset, or Shaeeli in play than having redundant copies in hand. I do like that this card does not care where the effect comes from, so it turns off your symmetrical effects like Howling mine, not that it sees play in this format but its going to be great in my turns list in modern. 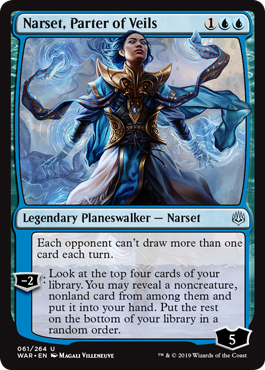 This does just put JTMS in his place, and supports your other walkers static effects by preventing you opponent from seeing new cards outside of instant speed stuff on your turn like Opt. If the worst case situation is that this comes down, impulses, and then make your opponent deal with it, it is probably already worth it. @craw_advantage yeah problem is Dovin is not a turn 1 play like Thalia. So maybe it's too slow to build a deck around. Dovin MAY be strong enough a card to merit trying to windmill him turn one, same as Lavinia which means there may be some critical mass. That seems like more of a turn one play than not to be honest. @protoaddict if you play 8 sol lands I agree. Otherwise it's not reliable enough to be as strong as Thalia (which it will never be since there's no Cavern for PWs yet). 8 sol seems excessive to me. Dovin is a turn one play, but the deck has a number of other cards that can be turn oned as well as counters it can hold on to. My guess is that 5 mox + Sol + Lotus + Crypt + Maybe Petal/Opal and a typical land base might be just fine to see him hit play turn one pretty regularly. I am excited about this card not because it will win me the game but because it synergizes so well with other strategies. I think this basically summarizes my reaction to this entire set. Nothing jumps out as obviously game breaking, but to echo another user in another thread, there are so many utility cards built here it's just waiting for a future brewer who will be addressing a meta challenge a few years from now. In the meantime it will remain to be seen whether synergies help new decks in our format where people seem relatively Meh on win-harder cards. All that said, we've been without a (consistently) viable prison deck for a while. Would like to see "Hatewalkers" come out swinging as a thing! Bolas's Citadel seems pretty close if it works out. Likewise Karn may prove to be problematic just because of his interaction with Lattice, but that is a little more of a long shot. Karn, Silver Golem also had synergy with Lattice and it was never a thing outside Commander, so I doubt this combo will have any impact (although I think Karn will be played, but because he's good by himself). I mean, Dredge just skips draws so it barely does anything unless you play this turn 1 off Lotus on the play. Even then, drawing 1 instead of 2 on the first Bazaar activation is barely a problem. I put my take on twitter. TLDR: I think this card has immediate applicability as an anti-PO planeswalker. It has build around potential in a Draw 7 shell, especially with London mull, and in a pseudo Grixis Thieves Shell with Vault/Key (pretty insane digging and combo potential). It is overrated against non-PO blue decks since it's very easy to remove via the attack step, which is a major limitation of a deck based on "HateWalkers" - They don't protect themselves very well against the go wide strategies in Vintage.